Whether you are a current home owner or looking to become one, putting your refund towards your home may be one of the more financially beneficial decisions you can make. If your plan for the new year is to purchase your first home, plan on saving that tax refund to put towards your down payment or to use for the many other expenses that creep up when going through the home buying process, such as moving costs and home inspections. Or perhaps you are holding off on getting pre-approved due to existing debt. Since you need to be mindful of your credit score and debt-to-income ratio prior to applying for a mortgage, paying down your credit card with the highest interest rate will move you one step closer to your goal of home ownership. 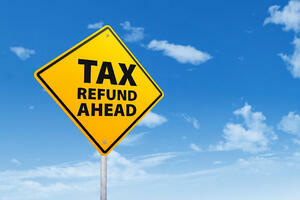 For the home owners expecting tax refunds, consider making an extra payment towards your mortgage principal. If you are able to commit to making even one or two extra payments per year, you can save yourself thousands of dollars by the time your mortgage is paid off. Other options for existing home owners include updating and refreshing your home. Unless your new-to-you home is actually brand new, chances are the appliances, flooring and fixtures could use some updating. Consider the age of your appliances. Perhaps they are working fine now, but thinking ahead and replacing them before they start to break down can save you time, money and frustration. What about your hardwood floors or carpeting? Whether you’re planning on staying in your home for your lifetime or looking to upgrade in the near future, sprucing up your floors can bring on a new life to your rooms. Perhaps your walls are covered in dated wallpaper or the paint color doesn’t fit your ideal style and décor. Or maybe your fixtures are a bit dated. Setting aside your refund to add a new coat of paint to your walls or to update your lighting and cabinet fixtures will completely transform your rooms with a renewed charm and elegance. If your home is older, another way to put your refund to good use and save money over time is to update your drafty windows and doors or add insulation to your attic. This option will save you money in the summer and winter months by improving your cooling/heating systems efficiency. Whether you choose a home improvement project, opt to make additional payments towards your mortgage principal or put your refund towards a down-payment on a new home, you simply cannot go wrong with investing in your home. Your home is a life-time investment that you want to take pride in, and investing in upgrades and even the smallest remodeling projects to refresh your home is always going to be a smart investment choice.